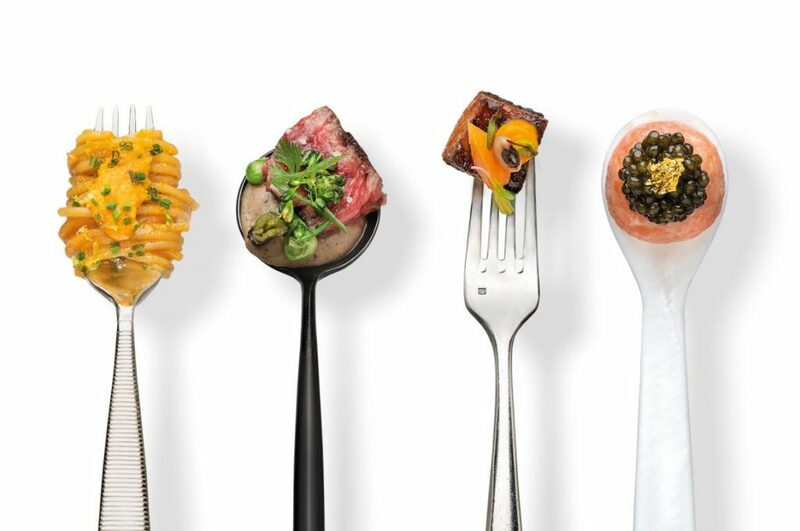 Recently, Ranch & Coast Magazine compiled a list of the Best Restaurants of 2019. We are thrilled that Casa de Bandini was chosen as Best Mexican Restaurant! See the full list: https://bit.ly/2F5349Q. Easter Brunch at Casa de Bandini! 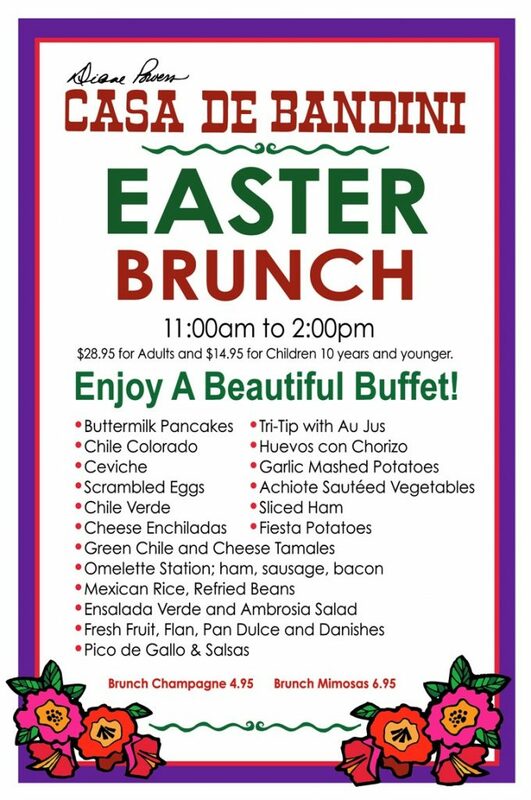 Make Easter Sunday a fiesta at Diane Powers’ Casa de Bandini in the Forum Carlsbad with a beautiful brunch buffet! It’s a Friday Fiesta for National Margarita Day at Casa de Bandini! Join us on Friday, Feb. 22 for National Margarita Day! We are celebrating by serving our famous house margaritas — which come in flavors like strawberry, raspberry, peach, banana, lemon-lime and mango — at our happy hour price of $6.50; all day, all restaurant. Bring your amor in to Casa de Bandini this Valentine’s Day and try our delicious three-course dinner for $29! 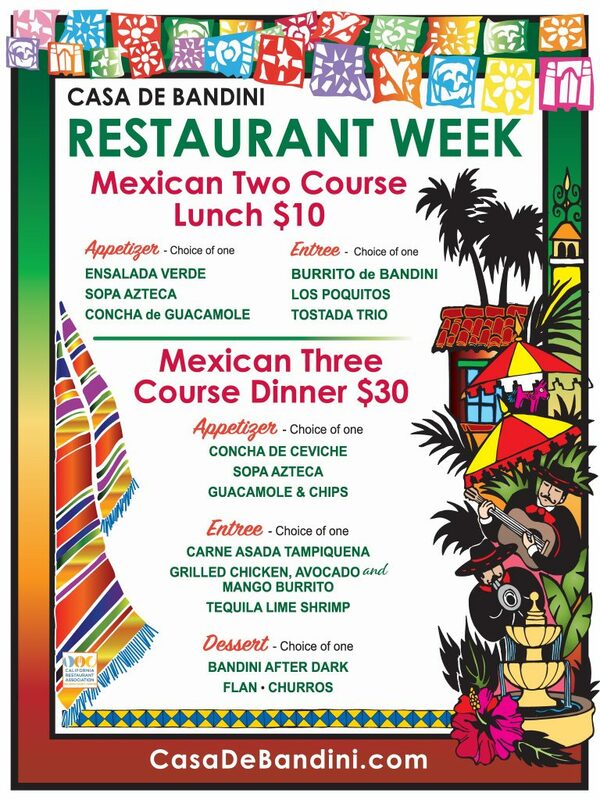 Join Casa de Bandini for San Diego Restaurant Week, Jan. 20-27! San Diego Restaurant Week is back! Join us for a week of delicious dishes and discounts, January 20-27. Check out our special menus below. 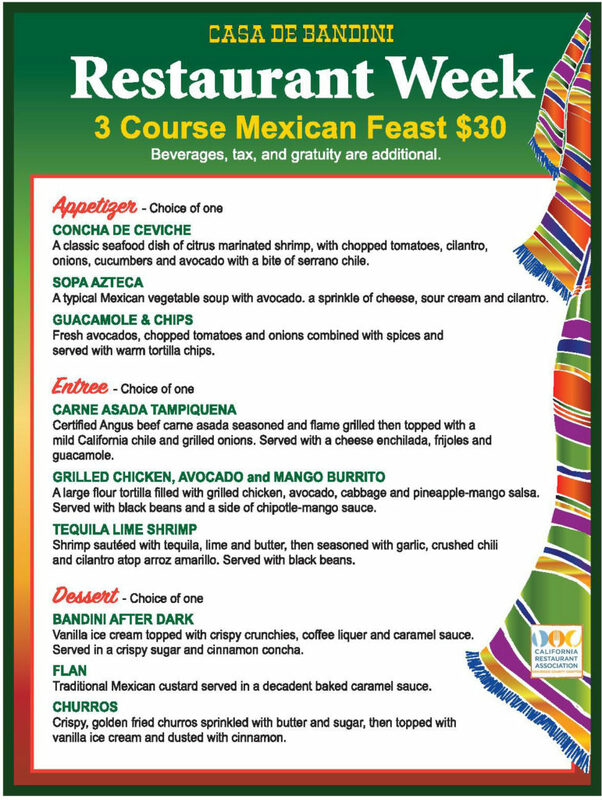 Treat Dad to a Father’s Day Fiesta! 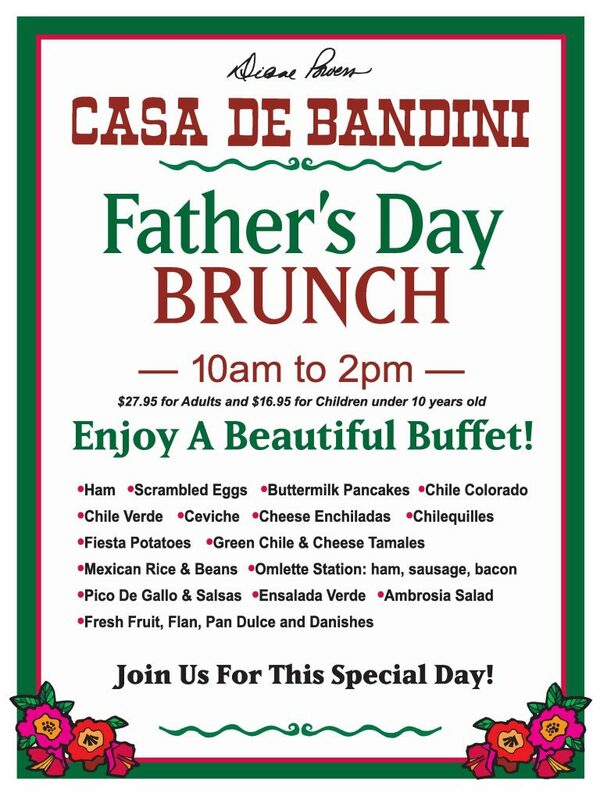 Treat Dad to a fiesta at Diane Powers’ Casa de Bandini in the Forum Carlsbad with a delicious brunch buffet! Guests will enjoy a wide variety of Mexican and traditional breakfast favorites including scrambled eggs, ham, bacon, sausage, chile verde, cheese enchiladas, fiesta potatoes, an omelette station, tamales, pancakes, ceviche, chile Colorado and chilequilles. End on a sweet note with fruit, flan, pan dulce and danishes. Check out our full brunch menu below. To make a reservation, call 760-634-3443. Enjoy live mariachi music, folkloric dancers, authentic Mexican cuisine and frothy margaritas during the Cinco de Mayo celebrations at Diane Powers Bazaar del Mundo Restaurants: Casa Guadalajara, Casa de Pico, Casa de Bandini and Casa Sol y Mar. Through her award-winning restaurants and Bazaar del Mundo Shops, Diane Powers continues to honor her love of Mexican culture. The embodiments of all things “fiesta!”, the Bazaar del Mundo restaurants will feature inspired “Cinco” fare, such as “Cincoritas,” delicious strawberry, kiwi and lemon-lime margaritas decked out in the colors of the Mexican flag; and “Enchiladas Banderas,” a savory sampling of chicken, cheese and beef enchiladas served with three different sauces – rojas, verde and blanca (red, green and white). May 5–6: Head to the “Two for Cinco” street taco bar in the Garden Room and enjoy drink specials in the lively Cantina, including cans of Tecate and Dos Equis for $5.50. Mariachis and ballet folklorico dancers will perform throughout the restaurant. May 5–6: Celebrate with carnitas tacos and Corona beer buckets! Additional drink specials will be offered both days, including hourly margarita specials featuring Tres Generaciones, Cabo Wabo and Don Julio tequilas. 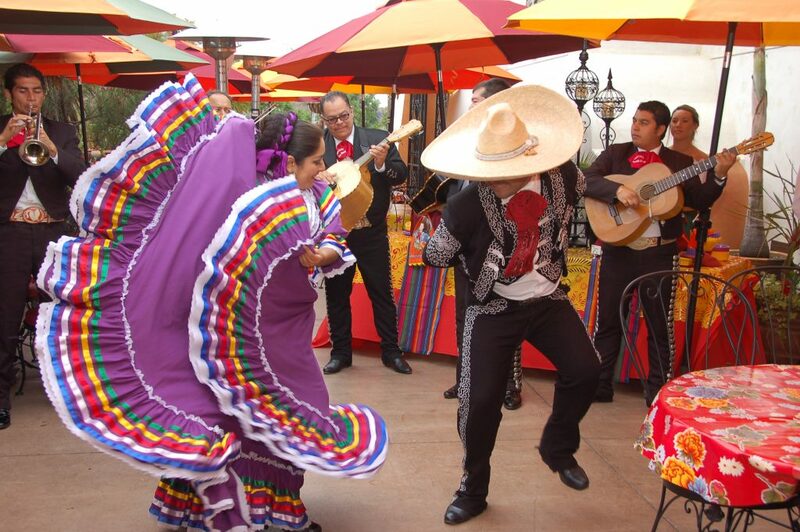 Mariachis, troubadours and ballet folklorico dancers will provide live entertainment throughout the restaurant. May 4­­­–5: Spice up your fiesta with the Carnitas Taco Sampler and wash them down with Casa de Bandini’s new Cazadores Palomas. Sip on specialty cocktails with drink specials by the hour, offered Friday and Saturday. The fiesta wouldn’t be complete without live mariachi music and dancers. May 4–5: Festive Cantina specials include “Tour of Mexico” beer buckets or Hornitos tequila flights for $20. Enjoy with the choice of a taco sampler, cantina tostada or jalisco wings. Music and folkloric performances will take place throughout the weekend. Sometimes confused with Mexican Independence Day (September 16), the Cinco de Mayo holiday celebrates the Battle of Puebla, in which vastly outnumbered Mexican forces defeated the Imperialist French Army on May 5, 1862. Fish Taco Fridays at Casa de Bandini – Your New “Gill-ty” Pleasure! 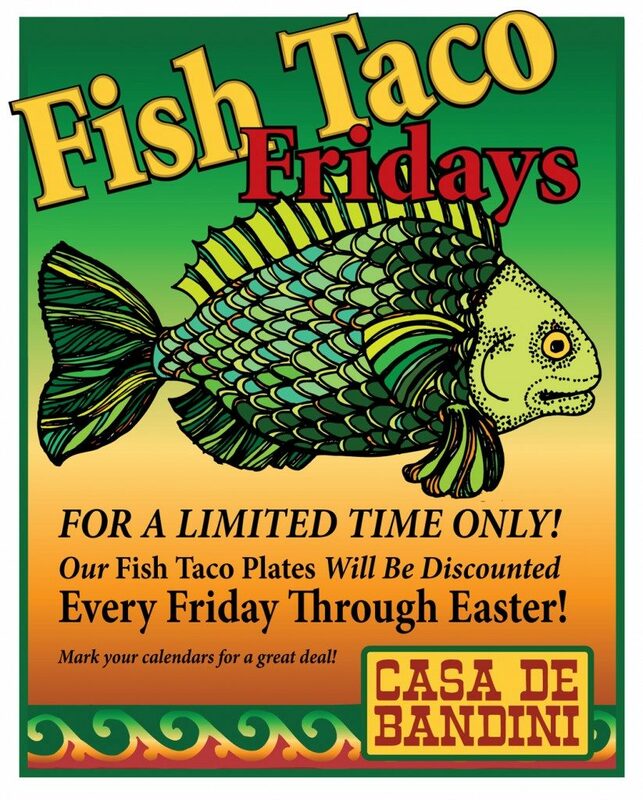 As if you needed another reason to say TGIF… For a limited time only, Casa de Bandini will be offering our signature Fish Taco Plates at a discounted price every Friday through Easter! From now until March 31, you can enjoy the same classic meal at an even more delicious price. Swing by our Cantina and pair this dish with one of our signature house margaritas, only $5.95 during Happy Hour, weekdays from 4-7 p.m.! Fish Taco Fridays – from now until March 31! 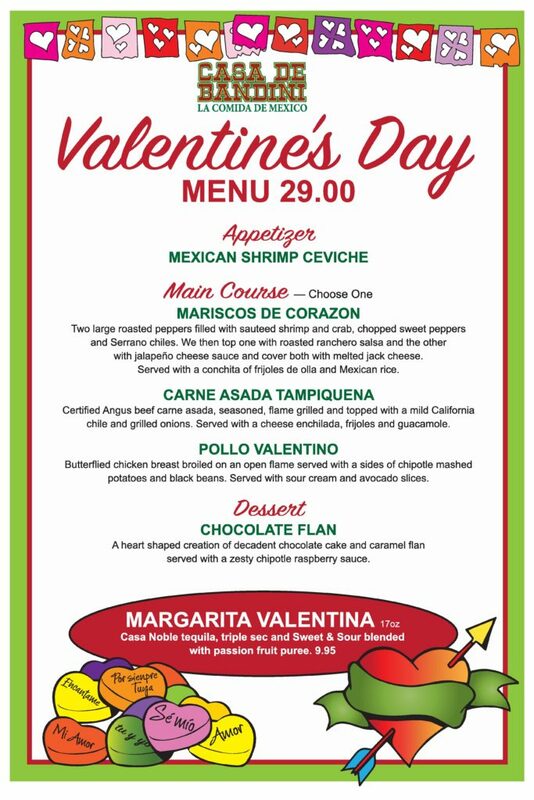 Celebrate Valentine’s Day at Casa de Bandini! Bring your Valentine to a warm, romantic dinner at Diane Powers’ Casa de Bandini in The Forum Carlsbad. Choose between Mariscos de Corazón, roasted sweet red peppers filled with sautéed shrimp, crab and melted cheese; Carne Asada Tampiqueña, seasoned, flame grilled and served with a cheese enchilada, beans and guacamole; or Pollo Valentino, butterflied chicken breast with chipotle mashed potatoes, black beans and avocado. End the meal with decadent chocolate cake and caramel flan served with zesty chipotle raspberry sauce. 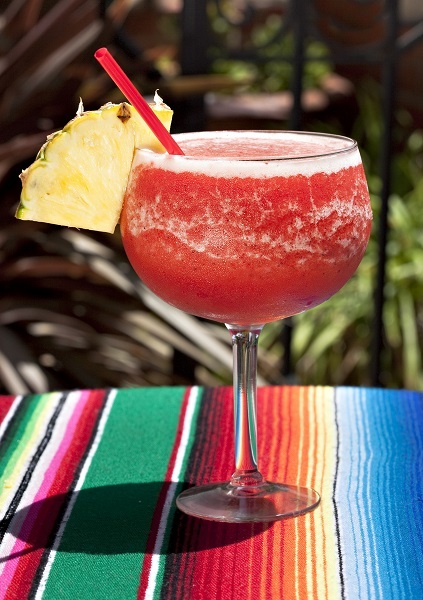 For $9.95, add a “Margarita Valentina” – a sweet and sour blend of tequila, triple sec and passion fruit puree. To make a reservation, call 760-634-3443. It’s a San Diego Restaurant Week Fiesta at Casa de Bandini! More than 180 of San Diego’s finest restaurants are gearing up to participate in San Diego Restaurant Week this year! 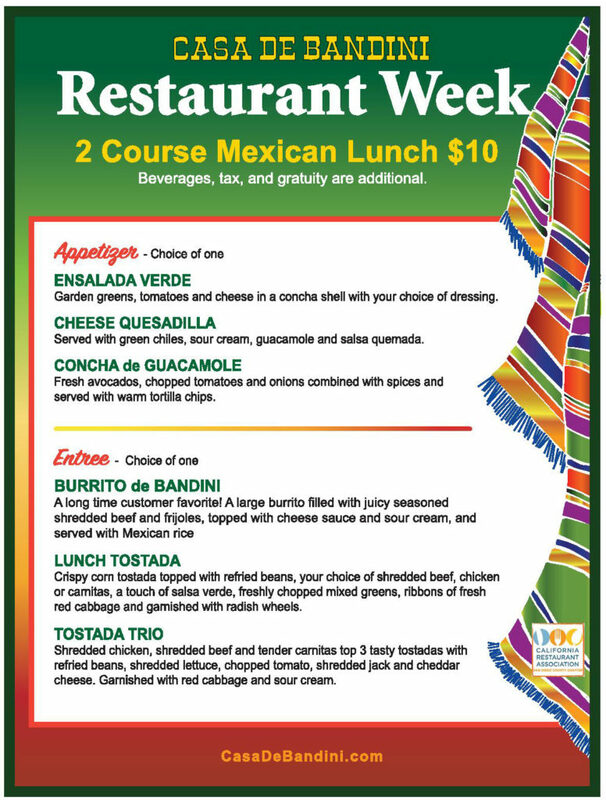 Starting next week (Jan. 21-28, 2018), your amigos at Casa de Bandini are offering up lunch and dinner options at delicious discounts. Check out our two menus below.